I have a grapefruit tree that's only about 16" tall which I grew from a seedling. Only a specific area of leaves on the bottom of the tree have developed yellow spots. They aren't spreading as far as I can tell, and from pictures it doesn't look like citrus canker. A leaf fell off today. 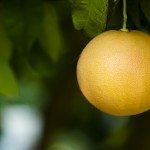 The picture and the symptoms you describe look consistent with citrus greening, an imported disease that has become a major problem in citrus-growing regions. The disease causes mottling with lighter-green areas that cross leaf veins plus leaf and fruit drop, and the symptoms usually affect only one section of the tree. There may be other possibilities, like nutrient toxicity if the tree has recently been fertilized, but the best thing to do is to contact a local extension agent to check your tree.